New - in stock at Forsyth now! 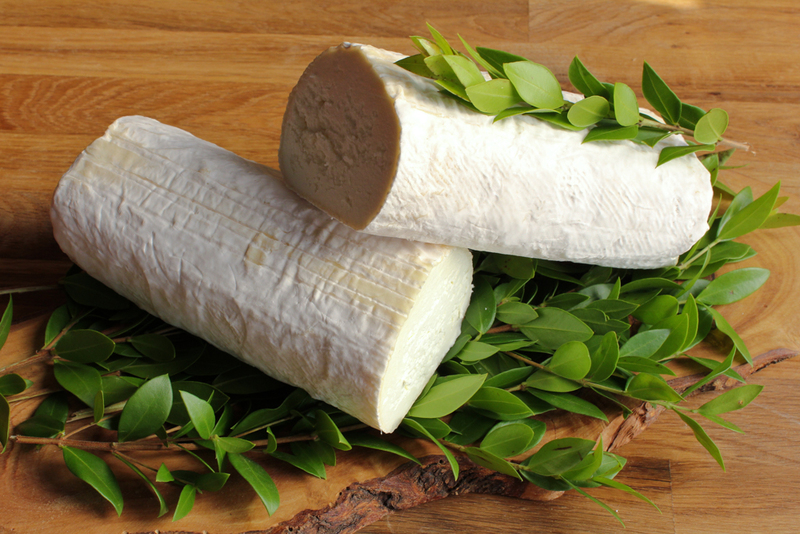 This dense, soft-ripened goat cheese is the Creamery's take on the classic bucheron. 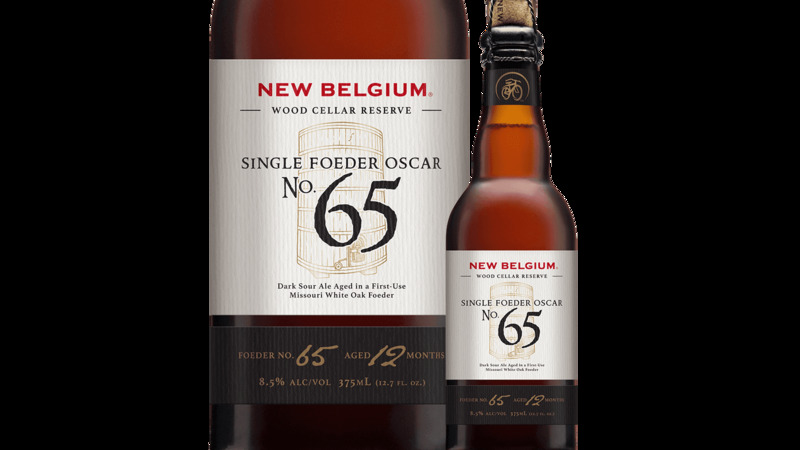 When young, the Log is creamy with a mild flavor that finishes clean with hints of citrus and just a slight bit of mushroom at the end. As it ages, the paste becomes firmer with a more fudge-like texture and deeper flavor. Covered in a thin bloomy white rind and about 4 inches in diameter, the Lincoln Log is one of our most popular offerings. This cheese is very good when sliced thin, topped with red pepper and broiled quickly. It can also be used on pizza, salads or just as is on crackers or bruschetta. La Tur is a delicious belnd of cow milk, sheep milk, and goat milk. It is a triple cream cheese from the Piedmont region of Italy -- more specifically Langhe. It has a very creamy paste inside the rind and the flavor is delicate but tangy. Very luscious cheese. 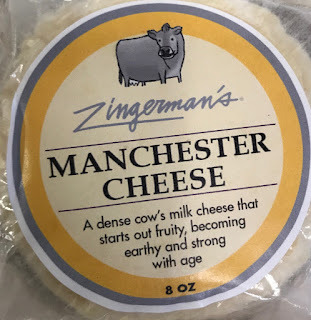 The Manchester draws it origins from a soft-ripened double cream cheese along the Welsh-English border, but through process differences (both intentional and unintentional), no longer bares any resemblance to its very distant cousin. Through gentle pasteurization and slow culturing of the milk, the Manchester retains an amazing expression of the character of the milk used to make it. The milk is pasteurized and heavy cream, bacterial cultures, and geotrichum mold are added and the milk is allowed to ripen for several hours. The geotrichum mold will grow on the surface of the cheese as it ages to give the surface a gentle wrinkled rind and help develop the cheese's savory, earthy flavor. The Manchester can be eaten at a variety of ages. At one week, the cheese retains a rich mousse like texture with a soft yogurt flavor. By week three, the cheese becomes denser with soft creaming around the edges and the farm flavors become more pronounced. The Manchester, when soft, is best on a French baguette with chutney and tomato. Because of the added cream, the aged version is firm and dense but slices very well and can be served with oatcakes or crackers and chutney (particularly Bushe Browne's Banana Chutney). The cheese can also be baked in a puff pastry. Extremely complex aromas of wet earth, mushrooms and blackberries. Medium to full body, gorgeous, velvety tannins and a dense mouthfeel. Very Compacted and long. A clearly outstanding young wine. Drink now or hold. 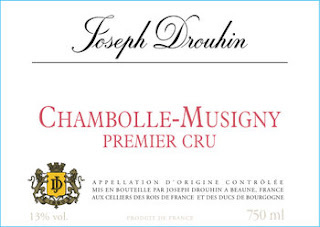 Some of the barrels of 2015 Chambolle Musigny 1er Cru were quite reduced, but eventually I found one that seemed more expressive with mulberry and loganberry scents, more incense with time in the glass. I like the conviction that this Chambolle demonstrates. The palate is structured with crunchy tannin, Morey-like in style with a precise and quite persistent finish that bodes well for the future. One to watch out for once in bottle, because it possesses the backbone that should see it age nicely. A distinctly ripe yet pure, elegant and still fresh nose consists of essence of red berries, spice elements and a hint of tea. There is evident minerality to the wonderfully textured middle weight flavors that are perhaps not quite as elegant as those of the villages yet there is better depth and length on the slightly firmer finish. Beer Tasting - Rock Hill location! Urban Chestnut Beer Tasting @ Rock Hill! Rock Hill Location - 9755 Manchester Rd. Our best selling Oktoberfest by far this year! 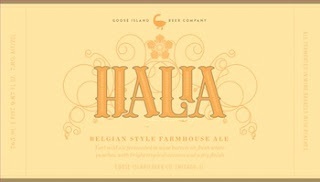 In our top 5 best selling beers! The #1 Pilnser in the World as rated by Paste Magazine! Aged and blended with a rye re-barreled in new charred oak quarter casks. 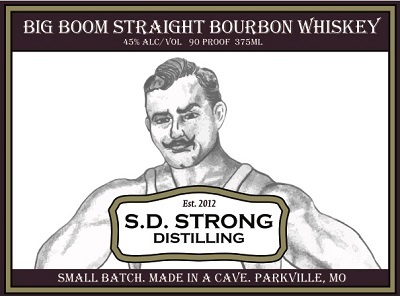 This exclusive release rye whiskey is artfully aged in Kentucky hillside rackhouses and bottled at a smooth 80 proof. Each glass of our golden amber rye is filled with the aromas of warm baking spices and tastes of caramel with hints of wood and charred notes. With a superior finish, it’s easy to enjoy Basil Hayden’s RYE whiskey and way you like. Our Oatmeal Milk Stout with Portola Coffee Labs' Alchemistic coffee. Medium-bodied, roasty and chocolatey, with a very smooth finish. SoCal meets South of the Border. This smooth, crisp lager is cucumber forward,complemented by a touch of lime, a pinch of salt, and a hint of heat. One particularly popular menjurje created by the family Reyes was the only one made from Puebla's signature crop: the beloved ancho chile. Ancho Reyes is the original ancho chile liqueur—a smoky, heated celebración of the radical, the romantico, the independiente inside us all. Rancho Reyes is born from the sacred earth of Puebla, an original liquid as unique and independent as the ancho chile from which it is made. of the glass and salt half the rim. and discard. Garnish with a thin grapefruit wheel. Most of the new releases will have a link on our blog to order and reserve them online so that you can transfer to the location of your choice. The blog posts are mostly based on what is arriving at our Forsyth location. Many of our customers have gotten the system down and get their stuff transferred over for the weekend to pick up. You do not have to run out immediately when a beer is released as you will get a confirmation and know that it is safe and sound and will be transferred to the location of your choice as soon as possible. If you get our emails or follow us on our blog/facebook/twitter/instagram and you see something you would like. You can place the order online, just hit the button. It is important to have an account set up on our website. If we get a rare item in stock, sometimes we post it and the fastest people to order the product will get it. You will not have time to set up an account at that time. For store pick ups, you do not have to put in a credit card. Just use the gift card option. We never charge your order for pick up until you come to pick up the order anyway. We do not need your credit card for pick ups. You will always pay at pick up, unless you specify otherwise in the notes of the order. There is a place when you checkout to leave a note for any special requests. For allocated items, you have 7 days to pick up or it goes back on the shelf. You will get a confirmation if we have the beer reserved for you and when it should arrive at the location of your choice. If the product is in stock at that store already, you will get a message that says "your order is ready for pick up at "store you selected'. Normal delivery days to each store. This is just a guideline for most of the time, subject to change some weeks. Saturday/Sunday: orders will be at Rock Hill about noon the following Monday. Saturday/Sunday: orders will be at New Ballas Monday afternoon. Transfers to Ballwin: (you will get a phone call when it arrives). Saturday/Sunday: orders will be at Ballwin Monday afternoon. You can also call each individual store for transfers. There is a chance they have the product in stock, otherwise they will coordinate to get it transferred for you. We can transfer wine, beer, whiskey, cheese.....anything we have!! We do also offer local delivery too. Call the store for details. Banks 7 Golden Age Blend is a complex, full-flavored blend that is sophisticated, but not sweet. This medium-bodied rum has a drier flavor profile than most Golden Rums, allowing it to stand out above anything else in the category. 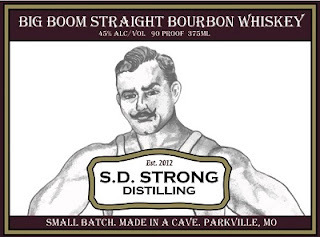 An outstanding blend of 23 rums from 8 distilleries from 7 origins give it complexity, character and depth. New Ballas 35th Anniversary Tasting! Let us know on facebook that you plan to attend! 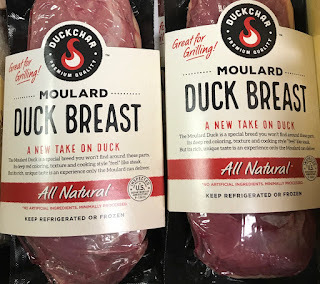 DUCKCHAR provides fresh Moulard Duck Breast. The Moulard is a hybrid cross between a Pekin and Muscovy duck. Moulard Duck Breast is extremely popular in France, but is generally-speaking unavailable and unknown to consumers in the US. Moulard Duck Breast is cooked to a rare or medium-rare doneness using same prep & cooking techniques as steak (beef). Once cooked, it’s hard to distinguish from steak in terms of texture, appearance and size - about 16 ounces/piece. However, it has a rich duck flavor twist. In the simplest terms, it’s like adding a rich duck flavor twist to a premium cut of steak. Moulard duck breast is differentiated from the more widely available Pekin duck breast because the Moulard is more comparable to beef rather than poultry. The average age of the vines is 50 years old. Winemaking Grapes are handpicked and sorted. The wine is then matured in oak barrels for 24 months. 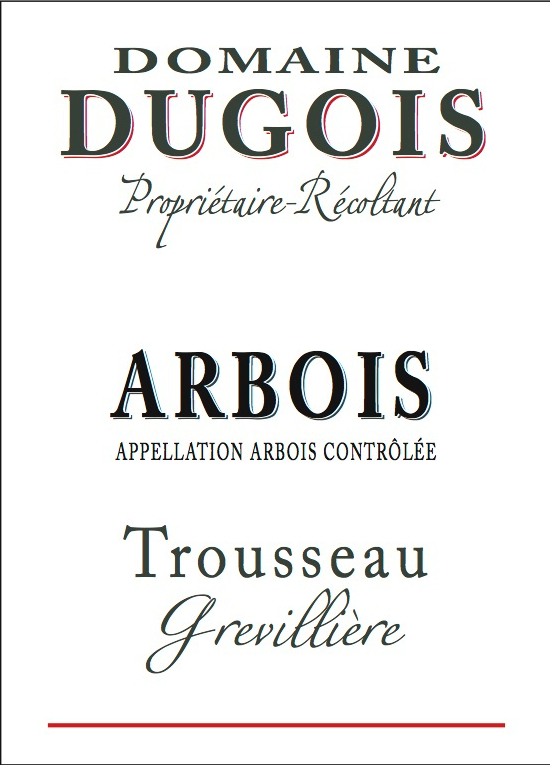 Story In 1973, Daniel Dugois bought 2 hectares of vineyard and a house equipped with wine cellars in a village called Les Arsures, where he was born. He cultivated the vineyard and sold his production regionally. In 1982, he made his first harvest into wine in his own cellars and began to sell his wine in bottles to consumers. 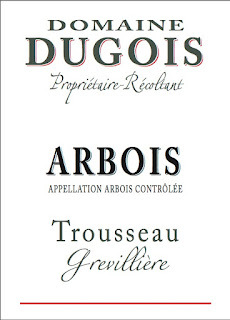 His first ever harvest earned him his first Gold Medal for his Chardonnay at the Jura Wine Contest. Ever since, Daniel and his wife Monique have continued to work on the quality of their wines, mainly for clients met at various wine shows and fairs and during tasting visits to their cellars. 79% Zinfandel, 14% Petite Sirah, 5% Carignane, 2% BarberaWhere we stand is so much more than soil. This is Hallowed Ground, a silent, solemn legacy of determination and tenderness. Combined with grit and endurance, and faith in spite of it all. 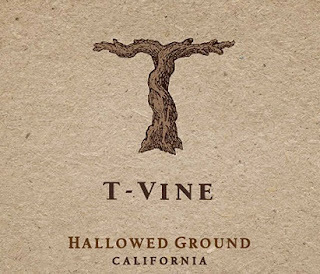 We call them Heritage vineyards, because they stand in testament to those grandfathers and great-grandfathers who, as far back as 1850, brought their vines to California in search of a new beginning and a sustainable way of life. Aromas of dark cranberry, baking chocolate, orange zest and a hint of cigar box. 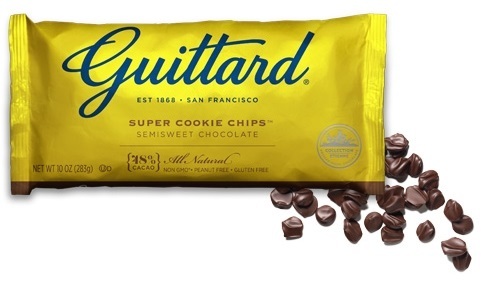 Rich, blackberry and raspberry coalesce with chocolate-covered cherries. Good weight, with mature soft and supple tannins and a silky, lingering finish. 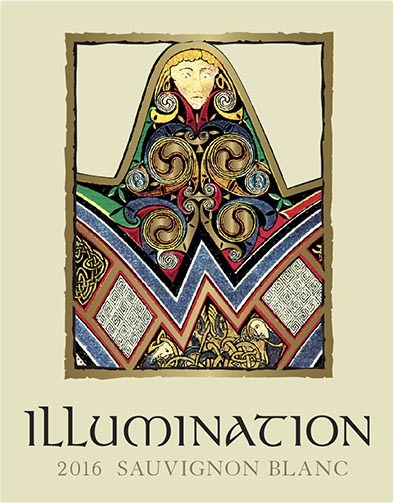 The 2016 Illumination is alive with aromatic complexity, beautiful texture and bright flavors. The fruit aromas of white peach, kiwi and guava interplay with fresh herbs, pink grapefruit, and beeswax honey create an intricate bouquet. On the palate, the wine dances with stone fruit, lemon zest, and a touch of minerality, followed by a fresh, flavorful finish. What started as a passion project for the Huneeus family, this limited bottling is one of Napa Valley's most sought-after Sauvignon Blancs. When making Illumination our ultimate goal is to produce a white wine of true character. We approach Illumination with the same care and attention as with Quintessa, with the aim of capturing the best qualities of our grapes and to craft a wine of harmony and balance. The 2016 Illumination is alive with aromatic complexity, beautiful texture and bright fruit flavors. This is an incredible vintage and the perfect summer wine that pairs with a variety of appetizers and seafood. The 2015 Washington blend has aromas of dark chocolate, cherry, black currant and black raspberry with hints of black licorice and baking spices. The dark fruit flavors on the front of the palate are followed by smooth tannins on the mid-palate, and a long, delicate finish. An aromatic Bordeaux Blanc offering floral, apricot and citrus aromas. The round, refreshing and wellbalanced palate shows remarkable depth, ending with a long, clean finish. Enjoy as an aperitif or with your favorite fish and shellfish dishes (especially white, flaky fish with lemon butter sauce and capers). 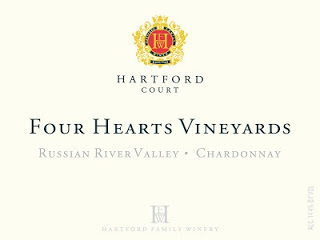 The 2015 Chardonnay Four Hearts Vineyard is largely from three clones – the old Wente clone of Chardonnay, the Sees and Rued selections. This wine displays plenty of wet gravel and crushed rock along with pineapple, white peach and marmalade. 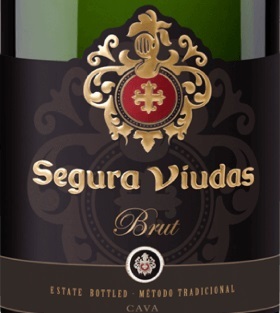 It is a deep, precise, exuberant and concentrated wine to drink over the next 7-10 years.